As musicians we are always told that 'music practice is the key to success on any instrument'...but nobody ever tells us how to practice. We are told that 'Practice makes perfect'...but nobody ever tells us how! In fact, practice doesn't make perfect. Perfect practice makes perfect! This site is about how to improve your practice techniques. Why do some people seem to do less music practice than you? Many people talk about ‘talented’ musicians... but it is tenacity not talentthat wins the day. Browse the site now to find new and exciting techniques and tips on practicing music to help you start making more progress in less time! The information on this website guides you towards achieving your musical goals efficiently, whether they are fame and fortune in the Classical or Pop world, becoming the next great film composer or being able to play for a local church or community group. This site helps you refine your goals and carry them through. 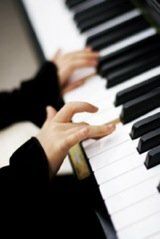 You will find downloadable sheets and information on general music practice techniques as well as advice for practicing specific instruments. Enjoy what you have read so far? Then subscribe to the Perfect Practice newsletter. This is a once a month newsletter with updates on what is new and popular on the site, additional articles on how to practice music more effectively and reviews of any equipment or software that may help you achieve your musical goals. I guarantee I will not sell your email on or spam you. I personally hate it when I sign up for a newsletter and end up with a pushy email a day or suddenly find myself on lots of email lists so I will not inflict that upon you! Recently I actually had to take much of the practice advice on the site and practice what I preach as I started learning the bass guitar! I was surprised at how much my practise technique differed from my time as a young learner and I do wish I had known some of these techniques then. I'm sure it would have help avoid quite a few arguments with my parents. I am also taking a course in Cinematic Orchestration with Hollywood composer and orchestrator, Charles Fernandez, and as I worked through the examples it struck me that I have always said that composition improves with practice, but now I am actually seeing (and hearing) the proof! And in amongst all this talk of technique please remember the most important thing when we play is to enjoy playing. If we aren’t enjoying playing, how can we expect others to enjoy listening to us? Enjoy browsing the site and good luck with your practice and your playing. If there is anything practice related you think I could help you with please use the Contact form and let me know. I'll do my best to help! I am currently working on a complete revamp of the site and some new material plus I am getting back to sending out the Perfect Practice newsletter again with helpful practice hints so if you aren't already subscribed sign up now. Effective practice is efficient practice. It’s not about how <i>much</i> practice you do, it is about how <i>smart</i> your practice is. Achieve more in less time! One of the best ways to make faster progress is to play games. We all like to play games and music practice games give us something to aim for that we all enjoy... Winning! Is scales practice important? YES! But most people don't know why or <i>how</i> to practice scales! Here is the answer! Being able to transcribe music is an important skill, especially for composers and jazz musicians. Here is a guide on how to transcribe music and reviews of music transcription software. The page from which to download the free ebook How to practice: 5 habits to help you make more progress. A metronome is a must have when practicing. Not, as many people think to make sure you are keeping up when playing fast... but to make sure you are keeping time when playing SLOW! Recording practice is very beneficial, and while a high quality digital audio recorder isn't necessary it is certainly very useful. This page contains information and reviews of a variety of models. This is the page for support with the iOS Music Practice App. Use the app to plan your practice each week and use your iPhone or iPod touch to make your music practice more effective. Using music practice charts to plan and record information helps you make more effective progress. Download music practice charts here. Information on my recommended online music courses for those who don't have a teacher. This list includes courses that are completed online and courses which are bought online to be completed offline. General music practice books on how to practice as well as books focusing on specific areas of practice such as sight reading, group practice, improvisation and memorization. Practice Makes Perfect is the book that teaches you <i>how to practice</i>. This book is all you need to stop working hard and start working <b>smart</b>. The way your music lesson notes are recorded during music lessons can have a great effect on whether you achieve your practice targets each week. Essential reading for all music teachers and students. There is more sheet music available than ever before both online and in traditional printed formats. Here is some information on the best places to buy and download free sheet music. Kids and practice sometimes don't mix. They say they want to learn, but they never practice! Here's some advice to help encourage them. Dealing with performance anxiety is something many musicians have to do every time they perform. Learn how to deal with music performance problems. A little extra inspiration often goes a long way and I hope some of these quotes about music inspire you. There are also links to other pages with quotes by musicians and quotes about music practice. A music practice resource for students, teachers, parents and anybody involved in music with news, reviews and tips on how to practice music. Get new practice tips as well as reviews of equipment that will help make your music practice better each mont. Subscribe to the <i><b>Practical Practice</i></b> newsletter here. Simon Horsey built the Essential Music Practice site to help music students develop the music practice skills needed to make faster, more effective progress. This is the story of how I built the Essential Music Practice website. Use this page to contact Simon Horsey about this site, giving a presentation to students about music practice, or anything else really! Submit your information here if you are interested in licensing Practice Makes Perfect to sell yourself. Learn how to hack your music practice with a new online course, because we all want to learn more in less time, no matter what the instrument or style.